This shift in perspective is empowering and inspires scientific curiosity. When I teach, I aim to stimulate this curiosity, recognize and build on it when it appears spontaneously, and use it to motivate my students. My interest in teaching grew side-by-side with my scientific training. As an undergraduate, I worked at Carleton College's Science Education Resource Center, editing and compiling online resources for geoscience educators. As a result, I became fascinated by the pedagogy of geology at the same time I was captivated by the science itself. This introductory course uses fundamental concepts in geology to explore natural hazards. Topics include using the geologic record to understand the frequency and magnitude of past events; the impact humans have on the processes that generate natural hazards; community resilience and risk reduction; and how natural disasters have shaped humanity’s relationship with the environment. 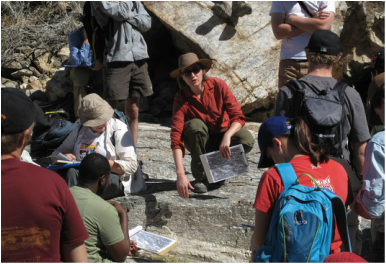 As a teaching assistant for upper-division undergraduate classes, I designed and taught laboratory assignments, lectured, lead in-lab field trips around the Tucson basin, and helped to lead overnight field trips in southern Arizona and California. ​I also presented guest lectures in the graduate-level course Orogenic Systems about the geochemical tools we use to study magmatic arcs. In the fall of 2007, I spent 12 weeks at the Osservatorio Geologico di Coldigioco (Frontale di Aprio, Italy) updating curricula, teaching field methods, grading, cooking, and providing extensive logistical support for Carleton College's geology field camp / study abroad program. Petrology, Structural Geology, and Introduction to Geology. Leading discussion of the S-C fabrics at Tanque Verde Falls in the mylonites of Santa Catalina metamorphic core complex, Tucson, Az. Photo credit: Pete Lippert. 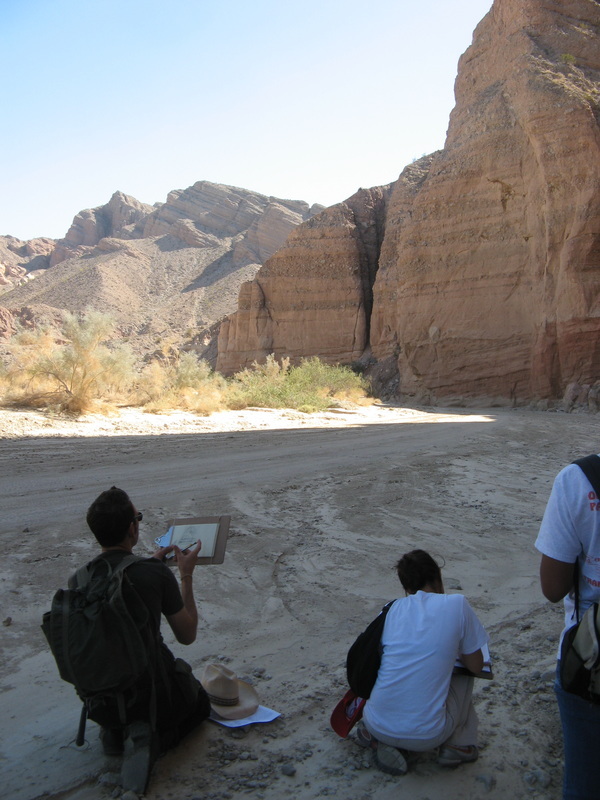 Sed/Strat students sketch late Miocene fanglomerates of the Salton Trough, which are spectacularly exposed in the Split Mountain Gorge, Anza-Borrego State Park, California.